Early Sports and Pop Culture History Blog: In a Toronto Minute? The Pre-History of "In a New York Minute". In a Toronto Minute? The Pre-History of "In a New York Minute". “In a New York minute” is an expression that refers to the fast pace of life in the Big Apple. The expression’s roots can be traced back to the 1820s, but not to New York City. The “York” in the original expression, “in a York minute,” referred to York, the capital of Upper Canada. 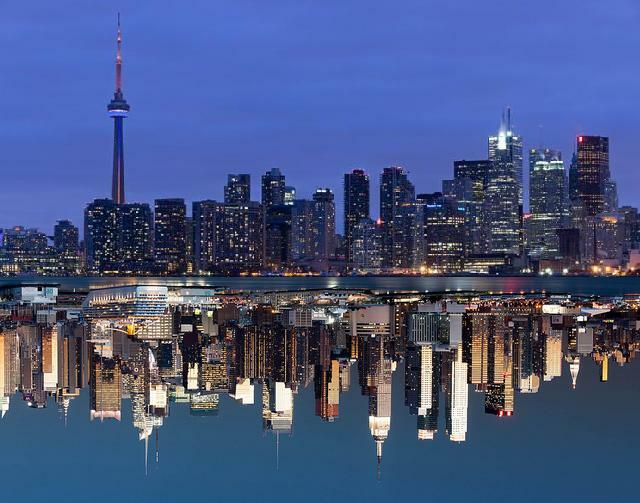 The “Town of York” officially changed its name in 1834, reverting back to the original First Nation’s place name – Toronto. Thus we call the capital of Upper Canada York, because there is a York in England; and as this metropolis is not of very great extent, and very likely never will be, it is termed Little York. Mr. Gourlay, for political reasons, conceives it to be very properly named, and plays away on the subject with considerable humour. A York shilling not being as large as a British one, tends also to detract from the importance of the place. It is a saying with the Americans, when they set about doing any thing quickly, “that they will do it in a couple of York minutes,” time being even considered of less moment at Little York than elsewhere. John Mactaggart, Three Years in Canada: an account of the actual state of the country in 1826-7-8, London, H. Colburn, 1829, Volume 2, page 359. Joseph Pickering, Inquiries of an Emigrant; being the narrative of an English farmer from the Year 1824 to 1830; during which time he traversed the United States and Canada, with a view to settle as an emigrant, London, E. Wilson, 1831, page 93. Here, as in most of the large towns of the States, is a prevailing custom among the trades-people, and others resident in the town, of dining at the Tavern, from which custom the ladies are by no means exempt; the dinner hour is generally one o’clock, and is announced by the ringing of a bell, something like the custom in many of our small towns in England, on a market day; to assemble the farmers to the market table – In an instant you will find them assembling from all directions, and with a magical quickness that would remind you strongly of the wand of an Ella, or a Bologna, the company are seated to dinner; the ladies generally grouping themselves at one end of the table: the operation of dissection immediately commences, and in the space of something like a “York minute,” very many of the chickens, and other delicacies, will have performed a transit to the plates of the surrounding assailants, while the “Apple-sauce’ and “long sauce” will be making their evolutions and revolutions in every part of the table. Anonymous Canadian Settler, The Emigrant’s Informant, or, A Guide to Upper Canada: containing reasons for emigration, who should emigrate, necessaries for outfit, and charges of voyage, travelling expences, manners of the Americans, London, G. Cowie, 1834, page 50 (italics in original). – By accounts recently received from Upper Canada, it appears that the Legislative Assembly of that province has passed a Bill altering the name of their provincial capital from “Town of York” to “City of Toronto.” . 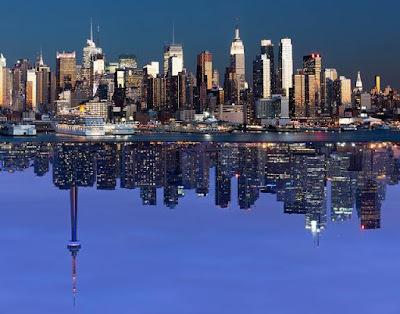 . . All newspapers, letters, &c. are now dated Toronto; and those who may have transactions with the capital of Upper Canada are now to address – “City of Toronto, late York.” – Cor. Of the Ayr Observer.). “York (Upper Canada) Is No More,” The London Observer, May 25, 1834, page 4. Renaming York as Toronto angered some provincial legislators. During a March 1, 1834 debate in the assembly, detractors like William Jarvis claimed the change would cause confusion. John Willison felt it disrespected the memory of the most recent Duke of York, and pointed out that neither the state nor the city of New York had changed its name. Proponents of Toronto pointed out the name’s aboriginal origins and its meaning, which was then believed to be “meeting place,” and so was well suited to the seat of provincial government. Some legislators, such as William Berczy, felt Toronto rolled off the tongue better than York (“the sound is in every respect better”). “Toronto is Born,” Jamie Bradburn, Torontoist.com, March 6, 2014. In short, we are ready for trade, and we say to all, Give us a Call; and will satisfy you in a “York minute” there’s no use in looking any farther. 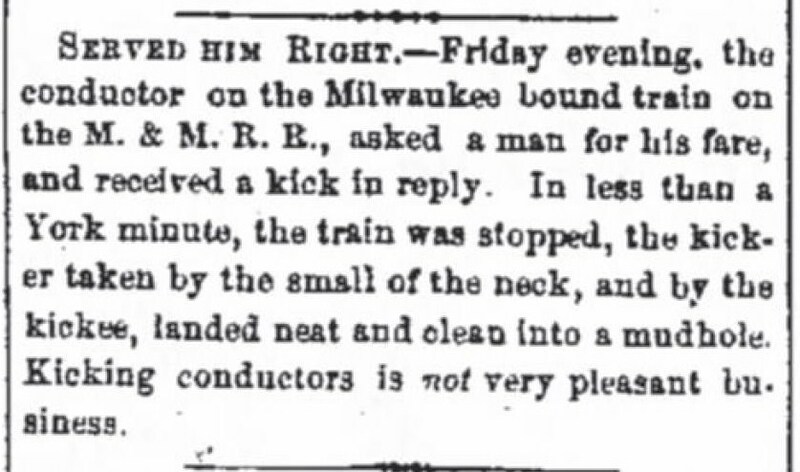 Penn-Yan Democrat (Penn Yan, New York), May 15, 1849, page 3. 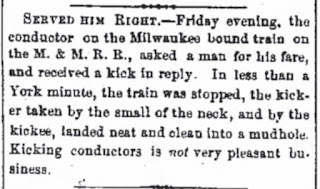 The Daily Milwaukee News (Milwaukee, Wisconsin), December 29, 1858, page 1. “There is one portion of the day,” as your correspondent vedry justly remarks, “which may, with propriety, be called the ladies’ hour. Just so. That “hour,” however, is to the day, what the “York minute”[i] is to the ordinary hour; viz: two hours and a half. The Buffalo Commercial (Buffalo, New York), November 24, 1860, page 3. Some of the bloods who were out on New Year’s business Monday night went to Gilman’s Hall at 4 o’clock yesterday morning, and one of them who met two Germans in the passage with a boy who had received an injury to his leg in the Hall, took hold of the wounded limb and gave it a twist. Although it was fun to the blood it was painful to the boy; his guardians stood upon the defensive, and both sides went to work “from the shoulder.” If any body supposes this transaction did not bring a crowd together in two York minutes . . . .
Hartford Courant (Hartford , Connecticut), January 2, 1861, page 2. Hartford Courant, February 12, 1861, page 2. Over time, as collective memory of the York, Upper Canada origins of the expression faded, the expression slowly became associated with a better known “York” – New York City. Hastly rising he jarken on his unmentionables, and, dropping on all fours, began to claw beneath the bed after the midnight intruder. He found it, and in one-fourth of a New York minute all the clothes there were upon him would not have made a bib for a china doll. The Post (Middleburg, Pennsylvania), September 15, 1870, page 1 (crediting the Titusville (Pennsylvania) Herald). Had David quietly backed out, he could have enjoyed his supper of venison and pancakes. But no, he raised the old rifle and fired. In one-fourth of a York minute, Bill Stewart’s exact time for skinning a Montezuma bullhead, all the clothes upon him would not have made a bib for a china doll. New York Times, December 31, 1872 (crediting the Auburn (New York) Advertiser, December 28, 1872). Before 1870, the expression was generally confined to the northeastern United States. But both the 1870 catamount story and the 1872 black panther story were reprinted in numerous newspapers across the country. The wide circulation could have helped spread the idiom in both of its forms. Numerous other examples of “York minute” appeared in print in American newspapers throughout the 1870s, ‘80s and ‘90s, but very few examples of “New York minute”. The Osage County Chronicle (Burlingame, Kansas), February 29, 1872, page 3. About two New York minutes slipped away into eternity. Then the air was rent with a sudden war whoop, the sitter made a clean jump of six feet, and a second after getting his equilibrium he was tearing off his coat tails and dancing all kinds of jigs. 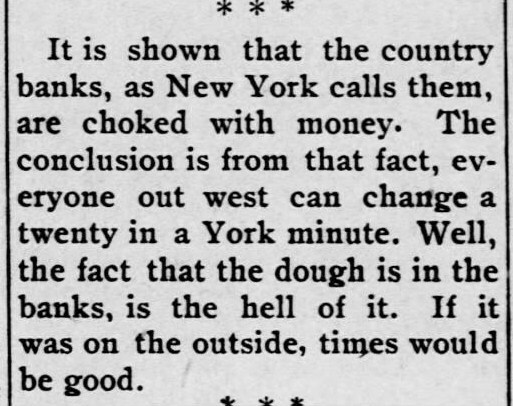 “The Sun Did It,” New York Sun, September 7, 1890, page 15. 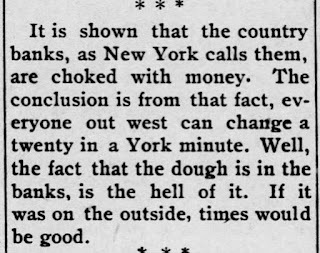 Atchison Daily Champion (Atchison, Kansas), August 14, 1903, page 1. The case looked pretty dark for Blackiston until he rose to plead his own cause. He painted a picture of domestic infelicity with a maiden who was defiant as well as obstreperous and who refused to be discharged and appealed to the jurymen as husbands and fathers if it wasn’t about the only thing left him under the circumstances to play the gun bluff game. All that he desired was for the rebellious young woman to leave the house and his bluff worked all right and perhaps prevented a scandal. The jury acquitted him in twelve New York minutes. The Des Moines Register, December 1, 1903, page 6 (crediting the Nebraska Journal). 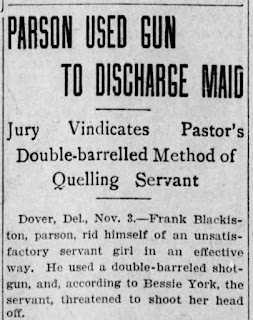 Evening Journal (Wilmington, Delaware), November 3, 1903, page 1. “Witnesses to-day have sworn against me, and what they say is about true. On the morning of August 17 I came down stairs very late and no breakfast was prepared. Miss York, although we had been trying to discharge her for two months, was lying lazily across the lounge. She refused to get my breakfast and I drove her out. She abused me and threatened me. “Now, gentlemen, put yourself in my place. I had to make my home safe. I started around the house, and knowing that my gun would bluff her and rid us of her, took it to the front door. Wouldn’t you, every one of you, have done the same thing? His eloquence brought his acquittal and unlimited rejoicing. 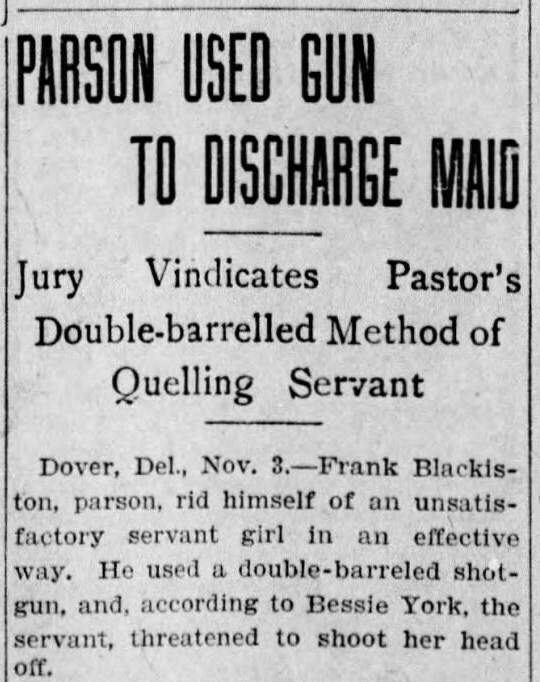 Philadelphia Inquirer, November 3, 1903, page 1. For less obvious reasons, the idioms “in a York minute” and “in a New York Minute” also disappeared at about the same time, until “in a New York minute” reappeared in Texas in the early 1950s. New York Minute - the Olsen twins. In an earlier post, I pushed back the earliest known use of the idiom, “New York minute,” by eighty years, from the early 1950s to 1870, but missed the business about the precursor idiom. Mea Culpa. See, Wildcats and Wildcatters – the Very Long History of a “New York Minute”.